Virgin Mother of God, most august Mother of the Church, we commend the whole Church to you. You bear the sweet name of "Help of Bishops"; Keep the bishops in your care, and be at their side and at the side of the priests, religious, and laity who offer them help in sustaining the difficult work of the pastoral office. From the Cross, the Divine Savior, your Son, gave you as a most loving Mother to the disciple whom He loved; remember the Christian people who commit themselves to you. Be mindful of all your children; join to their prayers your special power and authority with God. keep their faith whole and lasting, strengthen their hope, and enkindle their love. Come to the aid of those who find themselves in hardship, in need, in danger, and especially those who are suffering persecution. We commend the whole human race to your Immaculate Heart, O Virgin Mother of God. Lead it to acknowledge Jesus as the one true Savior. Drive far from it all the calamities provoked by sin. Bring it peace, which consists in truth, justice, liberty and love. Amen. 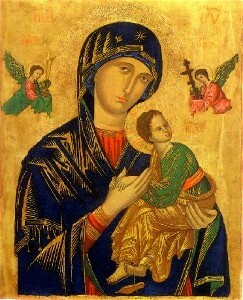 Image above of Our Mother of Perpetual Help - A 15th Century painting. Finished saying the Blessed Virgin Mary Prayer, Bring me Back to the Paryer List please.